Data from the government's Agricultural and Processed Food Products Export Development Authority (Apeda) show our shipment of basmati declined by 7.2 per cent to 1.17 million tonnes for the April-June period, first three months of the financial year, from the same period last year. Iran is the largest importer of India’s branded and unbranded aromatic rice (it took a third of all its export in the June quarter). Hit by trade restrictions from America, Iranian importers pay to Indian basmati exporters in rupees. “Usually, exporters get a certificate from Apeda and proper processes are followed. 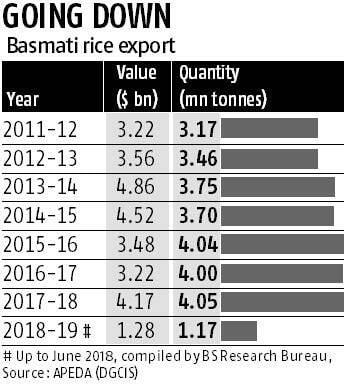 As per trade sources, several large basmati rice exporting firms have become non-performing assets with their bankers, due to non-receipt of payments against export of large volumes to importers in these brands,” said a senior Apeda official, on condition of anonymity. “We have taken up the issue with the trade ministry in Iran. But, it seems, Indian exporters would have to go only through the legal route to recover the money,” added the official. Apeda has advised exporters not to register contracts for export of basmati or make arrangement for payment before applying to it in this regard. Exports should be against formal orders which include quality specifications and a mechanism for resolution of disputes. “The situation might normalise in a couple of months,” said Gurnam Arora, joint managing director of Kohinoor Foods, an exporter of basmati.